BACKGROUND AND PURPOSE: The WEB aneurysm embolization system is still under evaluation but seems to be a promising technique to treat wide-neck bifurcation aneurysms. However, this device is barely visible using conventional DSA; thus, high-resolution contrast-enhanced flat panel detector CT (VasoCT) may be useful before detachment to assess the sizing and positioning of the WEB. The purpose of this study was to evaluate the interest of VasoCT during WEB procedures. MATERIALS AND METHODS: From March 2012 to July 2013, twelve patients (10 women and 2 men; age range, 44–55 years) were treated for 13 intracranial aneurysms with the WEB device. DSA and VasoCT were used and compared to depict any protrusion of the device in parent arteries before detachment. Two neuroradiologists reviewed each VasoCT scan, and the quality was graded on a subjective quality scale. RESULTS: The mesh of the WEB was very well-depicted in all cases, allowing a very good assessment of its deployment. Device protrusion was clearly detected with VasoCT in 5 cases, leading to WEB repositioning or size substitution. During follow-up, VasoCT also allows good assessment of eventual residual blood flow inside the aneurysm or the WEB device. CONCLUSIONS: Unlike DSA, VasoCT is an excellent tool to assess WEB deployment and positioning. In our experience, it allowed a precise evaluation of the WEB sizing and its relation to the parent vessel. Such information very likely enhances the ability to safely use this device, avoiding potential thromboembolic events in cases of protrusion in the parent arteries. We present here our experience using VasoCT as a systematic method to control WEB deployment before and after its detachment. Between March 2012 and July 2013, twelve patients were treated for 13 intracranial aneurysms with the WEB device in our hospital. All subjects gave informed consent for the treatment. There were 10 women and 2 men with a mean age of 52 years (range, 44–55 years). Endovascular treatment was performed by using a biplane flat panel angiographic system (Allura Xper 20/10; Philips Healthcare). Endovascular procedures were performed with the patient under general anesthesia and systemic heparinization. 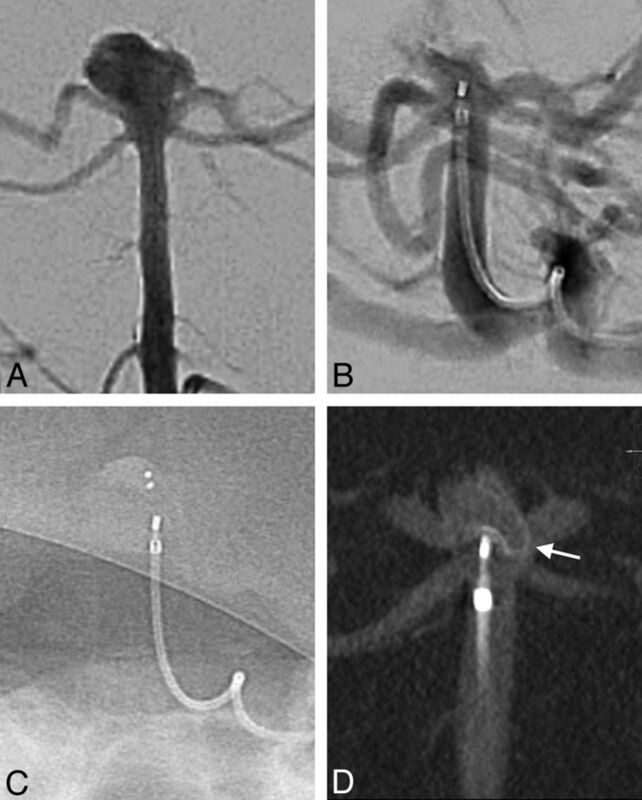 A guiding catheter, FargoMax 6F (Balt, Montmorency, France) was advanced in the internal carotid or vertebral artery. To deliver the WEB, we used different microcatheters and placed them at the base of the aneurysmal sac: Rebar 27 (Covidien, Irvine, California), DAC 38 (Concentric Medical, Mountain View, California), Headway 27 (MicroVention, Tustin, California), and Via 27 or 33 (Sequent Medical). The microcatheter was chosen according to the WEB size. The WEB size choice was based on 3D rotational angiography performed during treatment. Control DSA and VasoCT were performed before delivery. If the position was not satisfactory, the WEB was resheathed and repositioned. If the sizing was not adequate, the WEB was removed and another device was used. At the end of the procedure, both DSA and VasoCT were repeated after detachment of the WEB. 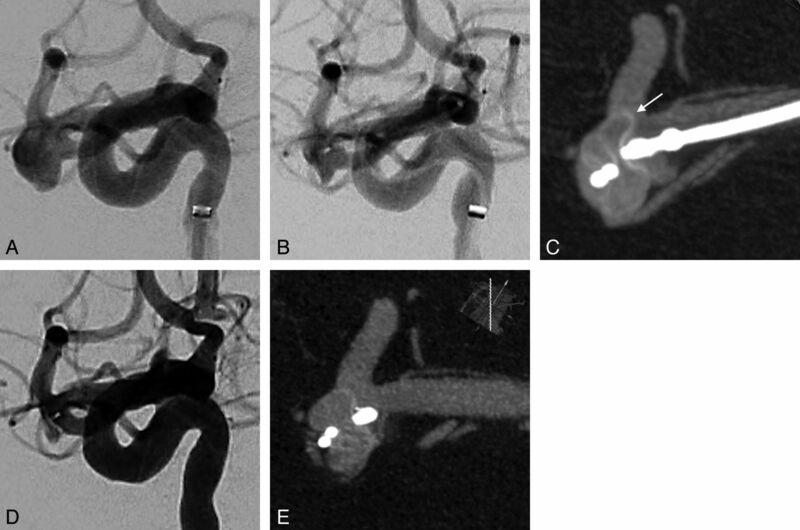 For high-spatial-resolution imaging of intravascular devices and their parent vessel lumen, a dedicated iodine contrast-enhanced conebeam CT protocol was developed (VasoCT). It is acquired by using a neuroangiographic x-ray C-arm (Allura Xper FD20; Philips Healthcare) equipped with a cesium iodide–amorphous silicon flat panel detector. The sensor area of the flat detector measures approximately 30 × 40 cm and consists of 1920 × 2480 pixels. The conebeam acquisition consists of a rotational trajectory over a 200° arc while acquiring 620 projection images at a fixed source-to-detector distance of 1195 mm. The objects of interest should be positioned in the center of the rotation, 810 mm from the source. The x-ray tube voltage is set to 80 kV; the focal spot, to 0.4 mm, while no copper filter is used. The associated radiation dose ranges from 45 to 49 mGy CT dose index. The imaged detector area is fixed to a diameter of 22 cm, which enables an unbinned pixel size of 0.154 mm, allowing very high-spatial-resolution 3D reconstructions. The 3D reconstruction is obtained by using the Feldkamp-Davis-Kress method.10 Preprocessing steps of the projection images include gain correction, scatter correction, water beam-hardening correction, and Parker weighting. The WEB VasoCT was reconstructed with a 5123 matrix covering a cubic FOV of 34.44 mm in each dimension. Figure 2 shows a VasoCT reconstruction of a line-pair phantom. As can be seen, up to 4.6 line pairs per millimeter (lp/mm) can be distinguished, which correspond to an intrinsic resolution of 0.109 mm according to the following formula: Resolution Intrinsic Millimeter = 0.5 [lp / mm]. 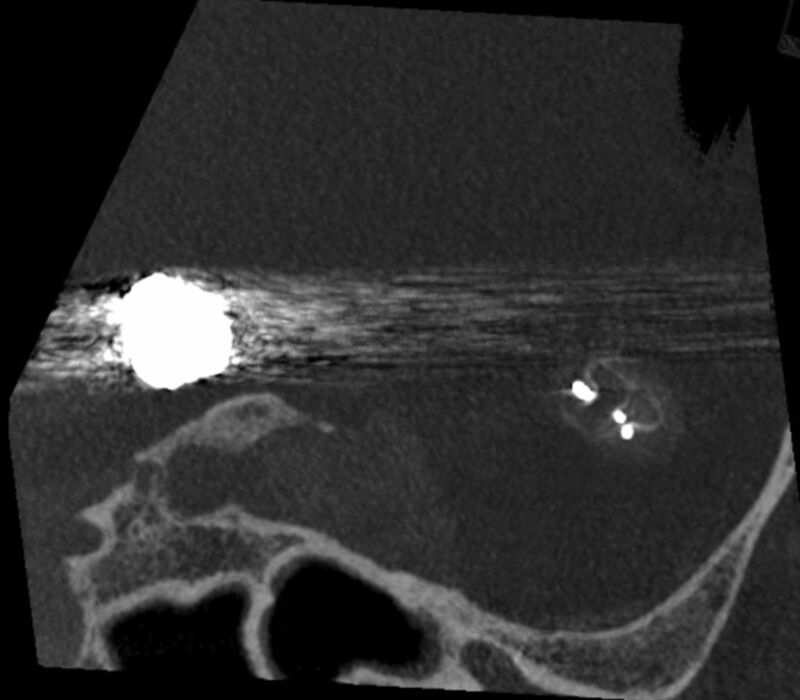 The spatial resolution is substantially higher than the resolutions reported for multisection CT. For 64-section CT, a resolution of approximately 1.5 lp/mm has been reported.11 The high spatial resolution of VasoCT allows imaging the stent struts of intracranial nitinol stents.9 To visualize the vessel lumen and the intravascular devices simultaneously, we used a diluted iodine contrast agent with 20% iodixanol (Visipaque 270; GE Healthcare, Mississauga, Ontario, Canada) and 80% saline solution. The total volume used was 90 mL at the injection rate of 3 mL/s. In case of streaking artifacts caused by nearby metal (eg, coils), the image quality can be improved by applying a metal-artifacts-reduction algorithm in a second-pass reconstruction.12 Data were analyzed with MPR and MIP reconstructions. VasoCT scans were reviewed in consensus by 2 interventional neuroradiologists. For every case, the quality of visualization of the WEB and the parent vessels was scored in ordered scales from 1 to 3. A score of 1 indicated that visualization was insufficient for evaluation; a score of 2 was given if the visualization was good; and a score of 3, if excellent. Metal artifacts from the WEB device and microcatheter, if present, were also evaluated. A score of 3 was given when no artifacts were depicted; a score of 2, if mild artifacts were observed. A score of 1 indicated severe artifacts, making evaluation of the WEB positioning impossible. Those scores were added to obtain a global quality score on a 9-point subjective scale. Global VasoCT quality scores were compared with WEB dimensions by using the Pearson correlation coefficient. Additionally, reviewers had to evaluate whether any protrusion, clotting, vessel occlusion, or residual neck was present. Most treated aneurysms were unruptured (3 ruptured cases), with an unfavorable wide-neck anatomy (mean dome/neck ratio = 1:1). The mean aneurysm size was 7.3 mm (range, 5–11 mm). WEB placement was not possible in 1 case because of the unavailability of an appropriate-sized device. Device protrusion was clearly detected with VasoCT in 5 cases, leading to WEB repositioning or size substitution (Figs 3 and 4). The average number of WEBs used to obtain good sizing was 1.3 per procedure. The total number of VasoCT scans reviewed was 31, with an average number of 2.4 VasoCT scans performed per procedure. The mean quality score was 6.6 ±1.4 (range, 4–9). Visualization of the WEB and/or the parent vessel was insufficient for evaluation in 3 cases of VasoCT (9%). Quality score was significantly and inversely correlated to the WEB height (r = 0.78, P < .0001). The visibility of the WEB is very poor with conventional angiography (Fig 5). Unlike DSA, VasoCT offers a very good visualization of the microbraided mesh structure and shape of the WEB device. It allows a precise study of its relationship with the parent arteries. This is fundamental before detachment of this completely retrievable device to avoid potential thromboembolic complications due to protrusion (Fig 6). We have encountered some differences in VasoCT image quality. Some features seem to be significantly influencing the visibility of the WEB. The device should always be placed in the isocenter of the acquired volume. All movements of the patient have to be limited; therefore, apnea is required during acquisition. No geometric disturbances should occur; these can be seen when the C-arm hits the infusion stand or table. High-attenuating items need to be avoided in the reconstruction plane of the WEB by positioning the head of the patient so that coils or clip streak artifacts appear in another plane (Fig 7). 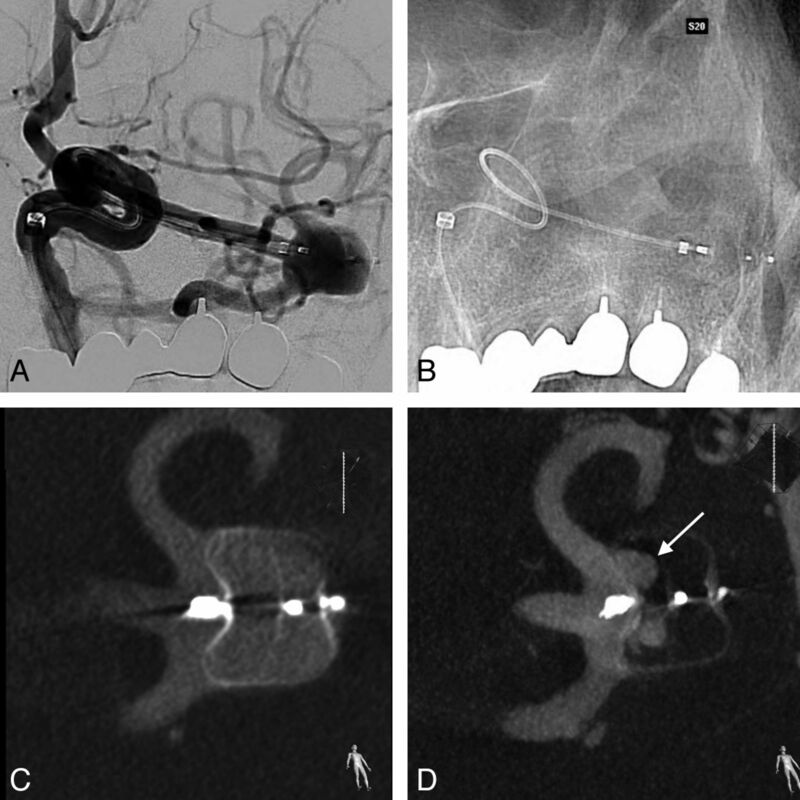 Metal artifacts reduction may be useful in some cases, especially when WEB-marker artifacts are projected over the parent artery (ie, MCA bifurcation aneurysms) (Fig 8). WEB markers made of iridium and platinum alloy generate significant metal artifacts (unlike nitinol mesh). We have noticed that distal markers of the delivery microcatheter, made with the same iridium and platinum alloy, also induce artifacts; they can be avoided by retrieving the catheter proximally in the parent artery. The quality score was inversely correlated to the WEB height. This observation can be explained first because the diameter of nitinol wires is variable (ie, smaller for the smallest WEB). Thus, the largest WEB sizes are more radiodense and easily assessed. This feature should encourage manufacturers to increase the visibility of the smaller devices. Second, the distance between the markers is small for the small WEB, leading to overlapping metal streak artifacts that are summed, deteriorating the visualization of the parent arteries. We advise a systematic calibration of the angiographic suite prior to each acquisition. 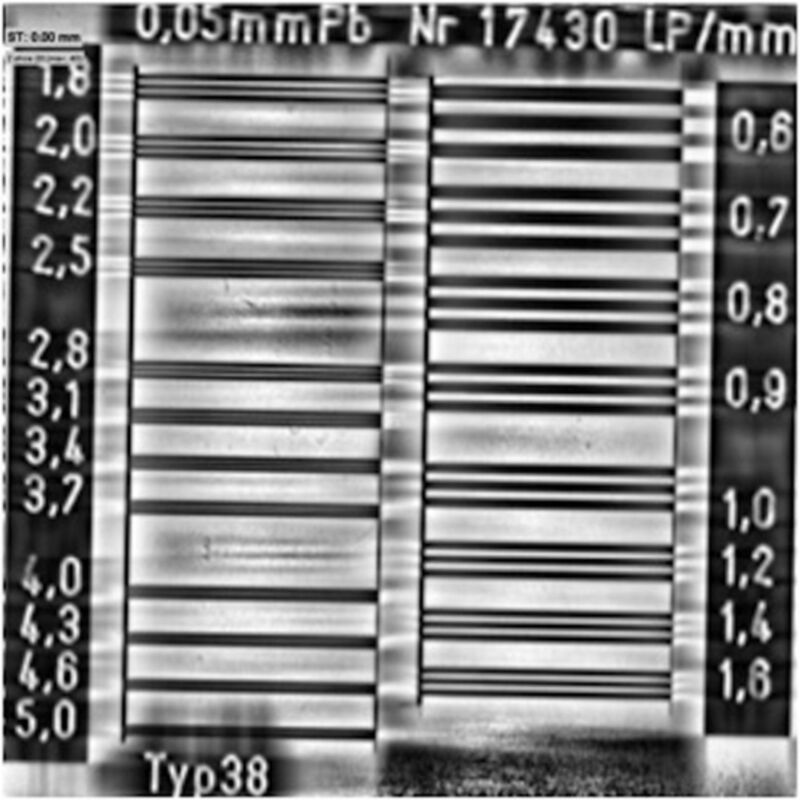 When the system is used for a long time with a reduced FOV (as is usual during a procedure), then the pixels that have been irradiated within this image format have a different response than the ones that were not irradiated. The calibration corrects this phenomenon, allowing an optimal image quality. Some authors report the use of 3D rotational angiography to control WEB positioning.5 There are similarities and differences between VasoCT and 3D rotational angiography. Both protocols are optimized for visualization of iodine contrast; hence, both use approximately 80 kV for the x-ray tube and both are optimized for high-resolution reconstructions (either volume-rendering or multiplanar mode). While VasoCT is meant for small contrast differences (with diluted contrast medium), 3D rotational angiography is meant for larger contrast differences (with pure contrast medium). To achieve the high contrast resolution, VasoCT acquires 620 images, whereas 3D rotational angiography records 120 images in the rotation. As a result, the VasoCT acquisition takes longer (20 versus 4 seconds); and because of the larger number of images, the reconstruction times for VasoCT are also longer (approximately 26 seconds versus 5 seconds for 2563). Because of its superior contrast resolution, VasoCT is the most appropriate technique for use with the WEB device. While VasoCT appears essential during endovascular treatment, it is also very useful during follow-up. It can be performed with the patient under local anesthesia, and it allows the assessment of any residual flow inside the 2 separate layers (Fig 3). Unlike DSA, VasoCT is an excellent tool to assess WEB deployment and positioning. In our experience, it allows a precise evaluation of the WEB sizing and its relation to the parent vessel. Such information likely enhances the ability to use this device safely, avoiding a potential thromboembolic event in cases of protrusion in the parent arteries. Disclosures: Daniel Ruijters—UNRELATED: Employment: I am a Philips Healthcare employee. Jacques Moret—UNRELATED: Consultancy: Covidien, MicroVention. Accepted after revision November 25, 2013.